Bose Mobile in-ear headset review | What Hi-Fi? 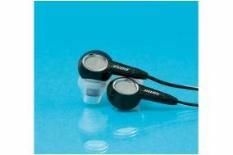 These Bose Mobile in-ear headphones sit in the outer bowl of the ear, with a sort of funnel to direct sound. In place they feel a little vague, but much less invasive than their rivals. The mic and one-button control are in a single unit on the right-hand cable, and call quality is excellent, with great all-round clarity. Music quality is a more reserved success – they're open, balanced, deep and refined, but we find ourselves longing for greater detail, dynamics and general excitement.